Maya Deren, committed perhaps more than anyone else to marrying choreography with film, once wrote: “There is a potential filmic dance form, in which the choreography and movement would be designed, precisely, for the mobility and other attributes of the camera, but this, too, requires an independence from theatrical dance conceptions.” This could well have been a mission statement for Wim Wenders’ Pina (2011), which attempts to re-imagine Bausch’s most famous works for a cinema audience and, specifically, for 3D technology. 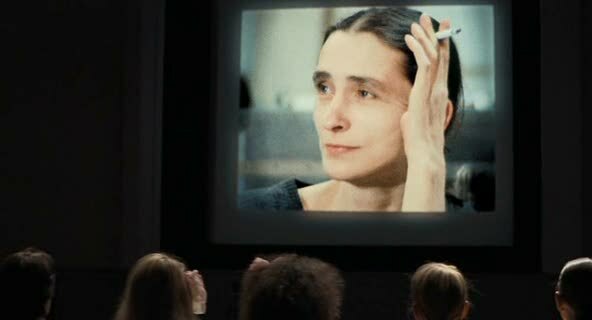 Consisting of an assortment of performances of Bausch’s famous pieces – performed on stage as well as outdoors in the choreographer’s home town – and interviews with her protégés, the film locates itself on this side of her passing and plays itself openly as a tribute rather than a cine-profile. Although it appears that art forms are being nested one inside another – Wenders’ film records Bausch’s choreography, which, in turn, is viewed as painting-on-stage – Pina comes across as collaboration between two art forms, as it is between two of its eminent practitioners – one feeding into another. Dance and cinema are presented as two universal forms bypassing verbal language, as is made explicit in the frequently interrupting (and consistently impoverishing) interviews in which we see Pina’s dancers – of different ethnicities, cultures and languages – sitting idly before the camera while their testimonies play as voiceovers, as though reducing both forms to their very basics – image and gesture. As for the dances themselves, we respond to the sheer physicality of them, more than their meaning, which is enhanced by Wenders’ restive, ever-tracking and craning camera that provides us the best of vantage points and brings us close to actually taking part in the performances. I am assuming then that this is a documentary, which I know is rare for Wenders (though obviously not for Herzog) but it’s one I’d be most interested in when it opens in NYC. Having Deren’s blessing of course is a kind of artistic validation, though few would argue the wedding proposed here. Wonderful capsule as always Srikanth! Thank you, Sam. I hope you catch up with the film, preferably in the itnended 3D format, which I couldn’t.